Today Amazon Prime debuted its second full length trailer for the highly anticipated Good Omens miniseries. It will be the first television adaptation of Neil Gaiman and the late Terry Pratchett’s classic fantasy novel Good Omens. Within hours, the new trailer racked up over one million views. In an action packed two minutes and thirty-eight seconds, the trailer debuted brand new visuals, subplots, and iconic supporting characters. To kick off the action, the demon “Crowley” (David Tennant) and the angel “Aziraphale” (Michael Sheen) banter back and forth. The apocalypse is nigh and the old adversaries realize they don’t want earth destroyed after all. Despite being charged with waging the war between heaven and hell to bring about Armageddon, they race to stop it. Matters are further complicated by the fact that they have misplaced the young Antichrist they were assigned to monitor. Meanwhile, the eleven year old Antichrist “Adam” (Sam Taylor Buck), leads his motley crew of friends to the end of the world. The Archangel “Gabriel” (Jon Hamm playing a character created for the show) explains why they must have a war (“otherwise, how would we win it?”). The horsemen of the apocalypse arrive in all of their sinister glory. The witch “Anathema Device” (Adria Arjona) and the bewildered Witch Finder “Private Newton Pulsifer” (Jack Whitehall) weather the storm of Armageddon. Special effects are revealed for “Satan”, “Death”, and Adam’s hellhound. As a fun callback for fans of the book, the trailer uses Queen’s “Under Pressure” as the soundtrack. In the book Good Omens, Crowley drives a Bentley that transforms all tapes left in it too long, into “Best of Queen” albums. 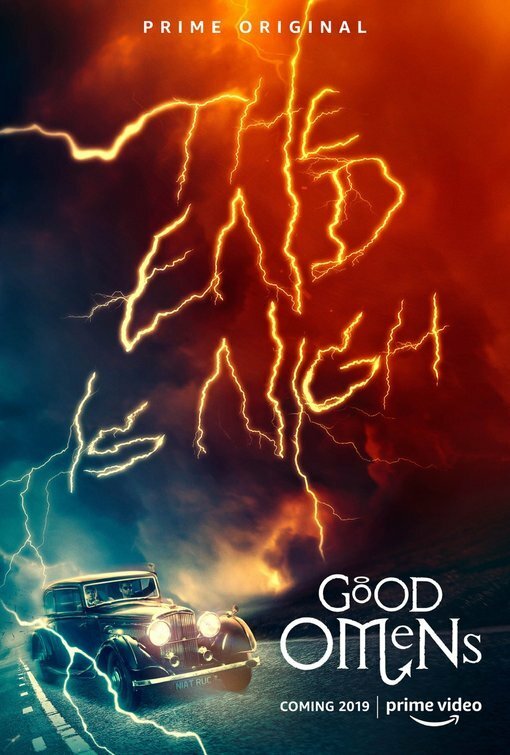 Adapting a classic fantasy novel with millions of passionate fans is a tall order, but co-author Gaiman himself is the showrunner, so it is no surprise that the trailer suggests a show that will capture the hilarity, irreverence, and imaginative spirit of the source material. Although their faces do not appear, it has been announced that an impressive cast will play Death (Brian Cox), Satan (Benedict Cumberbatch) and God (Frances McDormand). The six episode miniseries will be posted all at once on Amazon Prime Video May 31, 2019. Gaiman has said on Twitter that the miniseries covers the entire book and is a standalone. There is no reason to expect additional seasons. Check out the trailer below! Previous story Nerds and Beyond’s March Madness Tournament!